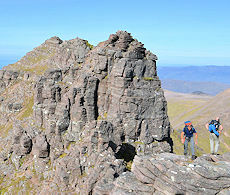 The remote landscape of the north-west of Scotland is the most rugged in the Highlands. Moorland is pitted with lochans from where imposing mountains rise abruptly and dramatically. 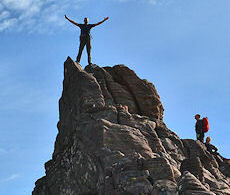 The landscape holds some of Scotland's most iconic mountains, one of which is An Teallach which we're planning to ascend on this exciting day. A day hiking into a remote and beautiful area. 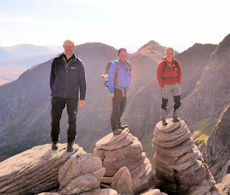 Bag the two Munros on An Teallach, Sgurr Fiona and Bidein a'Ghlas Thuill. 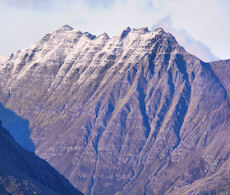 An Teallach's crests with their pinnacles towering above dark corries dominate the skyline from Little Loch Broom and Dundonnell. From Corrie Hallie, we'll hike up a good track gaining height gradually. As the ground levels, Sail Liath is our first objective. It is a long pull up the slope to gain the summit, but the views of the Corrag Buidhe make it all worth while once we get there! 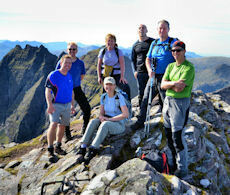 There is an intermediate top to go over before we start the ascent of Corrag Buidhe. Superlative sandstone makes for scrambling on good sound rock, and we'll take bypass paths to avoid any difficulties. We'll then head north-west for Lord Berkley's Seat - an overhanging rock high above Loch Toll an Lochain. Sgurr Fiona is not much further and we'll pause up here to take in the views. 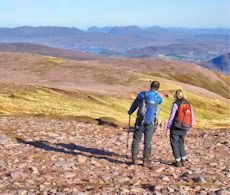 It is a straightforward descent and re-ascent to the last Munro of the day, Bidein a'Ghlas Thuill, before we descend down into Glas Tholl for the walk back to Corrie Hallie, passing some lovely waterfalls. 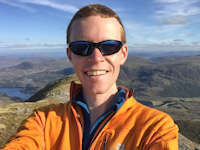 If conditions are not ideal for an airy scramble, we may opt to take an alternative route to the summits, perhaps taking in the ridge over Glas Mheall Liath instead of Sail Liath. Still guaranteed to be an interesting and challenging day ! We've classed this day as 'demanding'. There are rough paths at lower levels, with loose rocky ground higher up. The route we will be taking may involve some rock-scrambling typically Grade 1, with some options at Grade 2 and some good by-pass paths avoiding difficulties. Leading the event on 18 May'19 and 31 August'19. Our day begins from near Dundonnell, which is on the A832 around 55miles north-west of Inverness.